Mix flour, oil and salt and mix. now add enough water to make it a tight dough. Make sure the dough is tight not soft. Knead it for 5 minutes till it becomes smooth. Keep it aside for 10 minutes then make small balls in the size of lemon. Keep them covered. Roll out each dough to small disks. I work with 5 balls at a time. Try to roll them in same sizes. Now generously apply oil on top of 4 rolled out doughs. Also sprinkle some flour on top of the oil. Now place one dough on another and top with the one without oil. Make sure to stack them properly. Now heat a heavy tawa or frying pan. 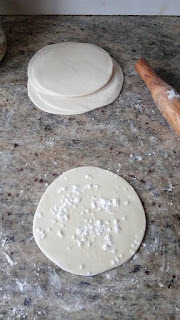 Generously sprinkle flour on your work surface and roll that stacked dough from center to the sides. Toll as thin as possible. Then on medium flame cook them for a minute or two on each sides. Carefully flip and cook for another minute. Take out and finally separate each layer by carefully peeling them away. It should be come off easily if you have used enough oil while stacking them. The sheets would be very thin almost as thin as paper and you could actually see through them. Now cut them in desired shape. I prefer to cut them in 3" long strips. 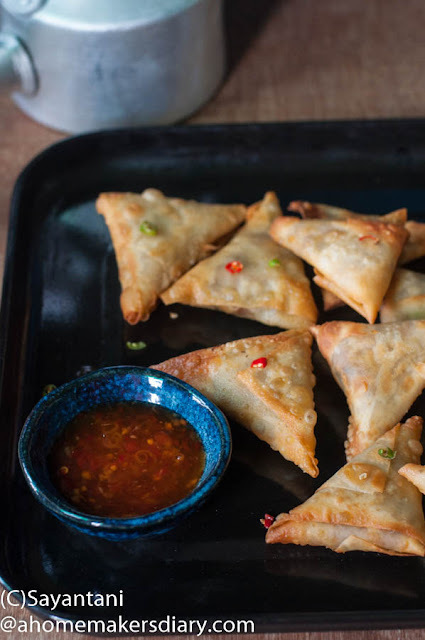 You can save them with generous sprinkling of flour in the freezer in an air tight container. They stay well for a couple of months easily. Mix the Keema with the ginger garlic paste, Yogurt and little salt. Also add the mustard oil. Cover and keep in fridge to marinate for 2-4 hours, better over night. Peel and chop the potato in small cubes. Heat oil in a pressure cooker and first fry the potatoes till golden. Take out. In the same oil fry the onion on medium till golden. Then add the mutton. Add chili powder, turmeric and mix and cook on low for 10 minutes or untill the juice dries up. Now add 1/3 cup water. Cover the lid the cook for 2-3 whistles on medium. Open when the gas dissipates in itself. The mutton should be cooked by now. Add the potatoes and dry up the extra moisture by stirring and cooking on low. Finally sprinkle some garam masala powder and let it cool down. 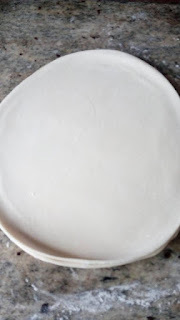 Mix the water and flour to make a paste. Take one of the 2.5" strip of samosa skin as shown in the picture fold it to make a pocket. (sorry forgot to click when I was making them so demonstrated with a piece of paper here). Fill the pocket with the cooled mixture and then fold again in a triangular shape till you use up the sheet. Secure the ends with the flour paste. Keep them on a greased plate. At this stage they can be frozen. 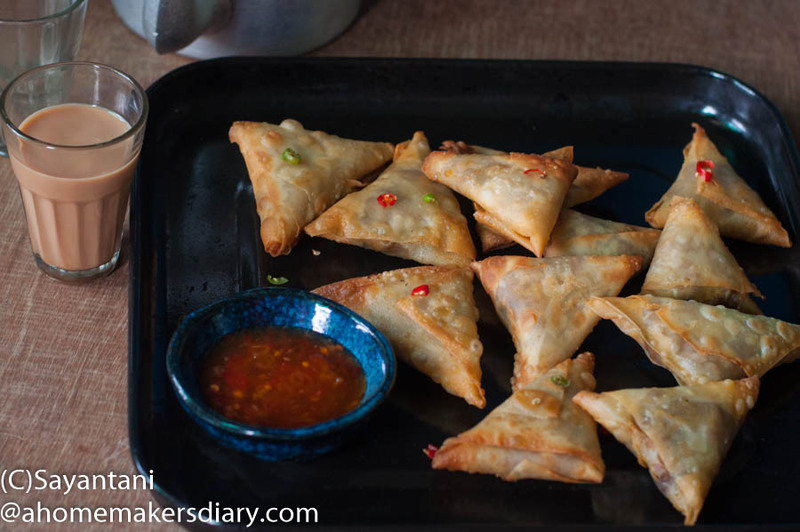 to do so, place them in simgle layer on a tray and freeze overnight. when they turn hard, store them in ziplock bags. Or just fry them in hot oil on medium heat till golden on all sides. Serve with any sauce of your choice. 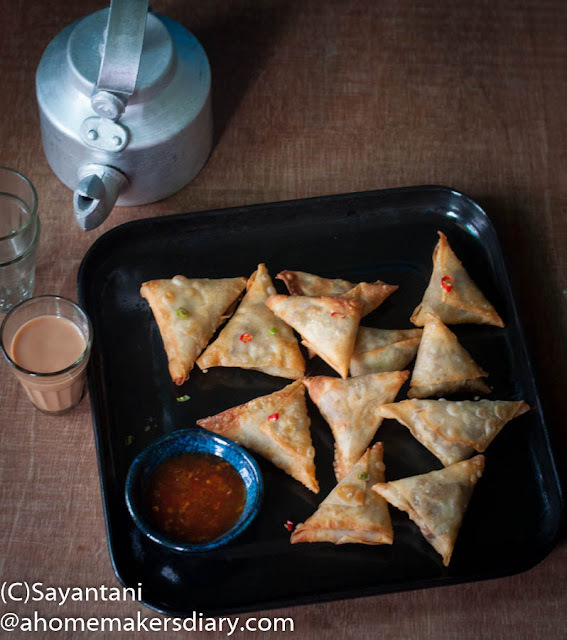 IF you find making samosa patti very hard then make the samosa following this recipe from my old post.